I would like to welcome guest blogger Levente Hunyadi. We often wish to edit properties of heterogeneous objects using a common interface. Matlab’s property inspector, invoked with the built-in inspect function, answers this need. The inspector is based on a two-column table of property names and values. Properties and their values are populated automatically, and the user can edit values in-place. The inspector enables property categorization, sub-categorization and sorting, which help users find and modify properties easily. For each property, the inspector displays a matching edit control: editbox/combobox/checkbox etc. This simplifies property value editing and prevents illegal value entry. Matlab’s GUI builder, GUIDE, uses the inspector to let users edit GUI properties such as position, color etc. 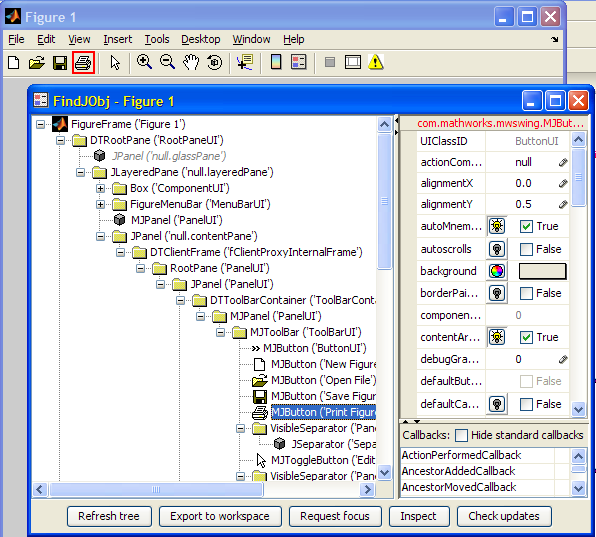 It is also used by other tools such as the Plot Editor. The Matlab inspector can be embedded, with not-too-much effort, within Matlab GUI applications. Examples of this can be found in the FindJObj and UIInspect utilities. Unfortunately, Matlab’s property inspector is limited to Handle Graphics, Java and COM objects, and cannot be used for structures or user-defined Matlab classes. We shall see below how to set up our own property grid, populate it with data, and subscribe to property change events. This is a rather procedural approach. It is usually more convenient to use a declarative approach in which a structure or Matlab class is passed to a function that automatically discovers its properties and their meta-information. The Property Grid utility at Matlab File Exchange provides these services. Matlab’s property inspector is based on a property grid control by JIDE Software. JIDE Grids is a collection of components that extend the standard Java Swing JTable component, and is included in each Matlab installation (/java/jarext/jide/jide-grids.jar under the Matlab root). In particular, JIDE Grids includes the PropertyTable class, which is a fully customizable property grid component. You can find further details on JIDE Grids in the Developer Guide and the Javadoc documentation. There are several related classes associated with the PropertyTable class. First, a PropertyTableModel encapsulates all properties that are visualized in the property grid. Each property derives from the Property abstract class, which features some common actions to properties, most notably to get and set property value. DefaultProperty is a default concrete subclass of Property. Finally, PropertyPane decorates a property grid with icons for changing category view to alphabetically sorted view as well as expanding and collapsing categories, and a description text box at the bottom that can be shown or hidden. Name Interal property name, not necessarily displayed, used as a key to identify the property. DisplayName A short property name shown in the left column of the property grid. Description A concise description of the property, shown at the bottom of the property pane, below the grid. Type The Java type associated with the property, used to invoke the appropriate renderer or editor. EditorContext An editor context object. If set, both the type and the context are used to look up the renderer or editor to use. This lets, for instance, one flag value to display as a true/false label, while another as a checkbox. Category A string specifying the property’s category, for grouping purposes. 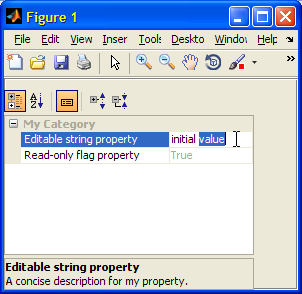 Editable Specifies whether the property value is modifiable or read-only. Value The current property value, as a Java object. Just as with any Java object, these fields may either be accessed with the Java get/set semantics (e.g. getName() or setName(name)), or the Matlab get/set semantics (e.g. get(prop,’Name’) or set(prop,’Name’,name)). When using the Matlab syntax, remember to wrap the Java object in a handle() call, to prevent a memory leak. Here, com.mathworks.mwswing.MJUtilities.initJIDE is called to initialize JIDE’s usage within Matlab. Without this call, we may see a JIDE warning message in some Matlab releases. We only need to initJIDE once per Matlab session, although there is no harm in repeated calls. javaclass is a function (included in the Property Grid utility, or directly downloadable from here) that returns a Java class for the corresponding Matlab type with the given dimension: javaclass(‘logical’) or javaclass(‘logical’,0) (a single logical flag value) returns a java.lang.Boolean class; javaclass(‘char’,1) (a character array) returns a java.lang.String class; javaclass(‘double’,2) (a matrix of double-precision floating point values) returns double. javacomponent is the undocumented built-in Matlab function that adds Java Swing components to a Matlab figure, using the given dimensions and parent handle. When the user closes the figure, prop.getValue() fetches and displays the new property value. This is great! I love finding new ways to display information! ??? Undefined variable "com" or class "com.jidesoft.grid.DefaultProperty". 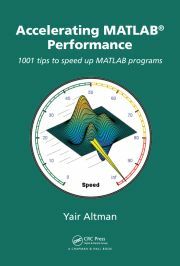 I’m using Matlab R2007b, it might be linked to this? @Simon – which platform/OS/Java version are you using? i.e., what’s the output of ver in your Matlab Command Prompt? Simon, I experienced the same with Matlab 2007b. Sadly enough, the DefaultProperty class is not included in the jide-grids.jar that comes with 2007b. There is a class Property, but this an abstract class and you cannot instantiate this without defining a concrete javaclass. As a rough solution, you may repace the jide .jar files in the folder ‘MATLABROOT\java\jarext\jide’ with the jar-files of for example Matlab 2008b (if you have it), this solves most of the problems. You can also include the jar files using the dynamic javaclasspath; this will add the DefaultProperty, but still gives errors. However, there should be a way to code the missing concrete classes in addition to the jide package of matlab 2007b. Personally, I would be very interested in such a solution. Perhaps someone with some more Java-skills can enlighten us? Meanwhile I have coded a property-inspector for matlab classes using the open-source package l2fprods, but I still have mixed feelings about its capabilities compared to the professional jide tools. A note to Yair and Levente: as you probably know, the class-structured PropertySheet and PropertyGrid products are not compatible with Matlab 2007b. I think the biggest (but solvable) problems lie in the method and property attributes, for example: replacing qualifiers like (Access = private) by (SetAccess = ‘private’) already solves most of the problems. but it cannot find anything. I can’t seem to find this on your site in many places, nor is it a submission on the file exchange. I pasted the ver information below. Also, I did try this in R2009b with the same results. @Jason – as explained in the article, javaclass is a function that is included in the Property Grid utility, or directly downloadable from here. After downloading this Java class, you need to place it in your Java classpath (see javaclasspath). My apologies. I thought the explanation for the example was all above the code itself. Leave it to a programmer to read a tutorial “serially”. Thanks a lot for this incredibly helpful blog ! I’ve got a question concerning this “homemade” Property inspector. I’ve been running your example with good results but now I would like my inspector to be resizable. Do you have any idea on how to achieve that ? Additional information on the javacomponent function can be found here. we’ve used severeal Jide classes (at least PropertyTableClass and PropertyTable) in our project for quite a long time. Recently, we migrated the project from R2010b to R2015b. Unfortunatly, in R2015b we get a warn dialog while compiling our application. The warning comes frome JIDE Software, Inc. and states “You get this message box because you didn’t input a correct license key. …”. Do you know if it is possible to compile MATLAB code based on JIDE classes without this warning?